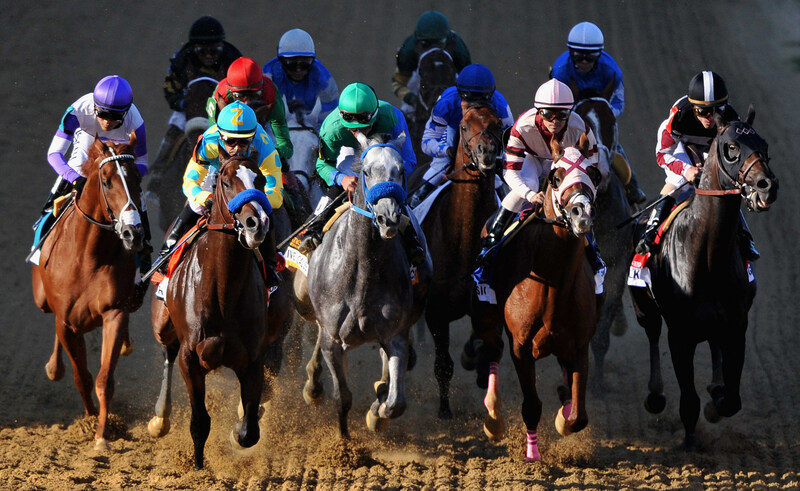 In the second installment of our Belmont Stakes preview, we break down our expectations of the race, and give you some helpful betting suggestions. For a brief look at each of the entrants in the race, and a full audio preview, click the respective links at the bottom of this article. He ran down the win in the Kentucky Derby. He ran down the win in the Preakness. Saturday, I'll Have Another will take to the Belmont track and look to run down not just another Grade 1 stakes, but his place in horse racing legend, in immortality - the Triple Crown. First Turn: Down the stretch for the first time and into the first turn, look for long shot Unstoppable U to be ahead of the cavalry charge. I expect a little more speed than most analysts do, with Paynter and My Adonis pressing on the leader's flank. Five Sixteen and I'll Have Another will sit fourth and fifth, with Union Rags, Guyana Star Dweej, and Street Life not far behind. Dullahan, sitting a little closer than usual, will fall in behind this group, likely holding with Atigun, ahead of Optimizer who will trail the field. Top of the Second Turn: Much of the form described above will hold down the back stretch - with Unstoppable U setting reasonable, yet decidedly quick fractions - but expect Dullahan to slowly move up, and position himself slightly more forward than normal. Only one Belmont winner has hit the top of the stretch outside the top three...he was fourth. Dale Romans knows this, he'll want Dullahan poised. Midway Through the Turn: The sweeping turns of Belmont have often turned the tide in this race, and here is where I'd expect you to see the stakes' first bit of fireworks. Expect Union Rags - who loves to make his move on the turn - to make a bold run toward the front while Paynter takes over the lead from a spent Unstoppable U. I'll Have Another will stir, moving toward the front but without quite making his move. Dullahan will begin to move more now as well, placing himself mid pack as the field bunches up. Top of the Stretch: And as the field strikes the top of the stretch, it will be Union Rags striking the lead and pulling away from the second place Paynter. I'll Have Another, in a rather cool effort, will have taken over third from Unstoppable U and begin to drive, with Duallahan, sitting somewhere around fifth or sixth, beginning to move in earnest. Expect Street Life to be revving up his run as well. Mid Stretch: Through the long stretch of Belmont, I expect a three horse race to develop. I'll Have Another, now making his customary strong run down the stretch, will catch Union Rags and run neck and neck with him toward the wire. The question then, will become wether or not either of them can hold off the thunderous charge of Dullahan down the middle of the track. Finish: In the end, I wouldn't be surprised if any of the three favorites clipped the wire first - this is really a 6 to 5 and pick 'em kind of race. But forced to make a prediction, I'll say that it will be Dullahan using every bit of that mile and a half, to capture the Belmont - deferring our Triple Crown hopes to next year. So much of the Belmont relies on a jockey knowing when, exactly, to send his horse. I guess I just trust Javier Castellano more than Mario Gutierrez. And factoring in the stress of this being I'll Have Another's third race in five weeks, I see this as a tough one for the colt to win. I'll say he'll take second with Union Rags finishing third and Street Life rallying to take fourth away from Paynter. Who to Bet: To me, the only bet here is a four-horse exacta or trifecta with Union Rags, Dullahan, I'll Have Another, and either Street Life or Paynter - they're the only horses I could see winning. If the morning line odds hold for either Union Rags or Dullahan - which they won't - they'll be worth win bets, but the exotics are likely your play here. As for long shots, any odds would have to be absurdly long to earn my money. At anywhere north of 50 or even 60-1, I could take flyers on colts like Atigun, Five Sixteen, and Guyana Star Dweej; I don't see these horses getting anywhere near the money, but the Belmont is flukey, and if the price is right, it could be profitable. Still, this is a battle of stars. I'll Have Another. Dullahan. Union Rags. Either of those three could take this race, and while I'm calling for Dullahan, I'll be betting Union Rags, and I'll be rooting (and betting) for I'll Have Another. Because having spent so many years watching horses chase this dream, and having seen all of them come up short, I'm ready. I'm ready for a Triple Crown winner. Too often I've seen the Test of the Champion prove its challenger unworthy. I'm tired of deferments, I'm ready for coronations - And in I'll Have Another, we've got the livest shot we've had in a while.